I'm working on the finishing touches of my home office makeover. I hope to share some pictures with you next week. I've already "moved in" and it's such an awesome space to work in. 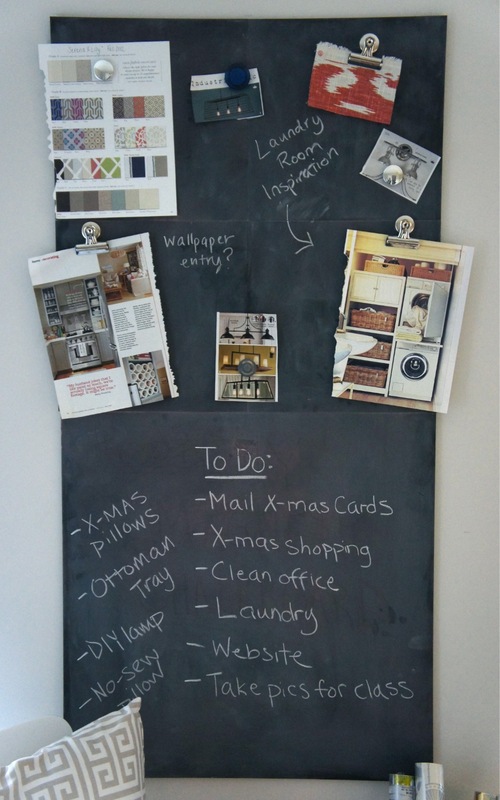 One of the projects I worked on this week was a DIY magnetic chalkboard. I read quite a few tutorials on what to do and what not to do and I ended up putting my own spin on it. This post by Less-Than-Perfect Life Of Bliss was quite helpful (especially reading about the problems she had with magnetic paint). I didn't want to paint directly on the walls with chalkboard paint because I wasn't sure exactly where I wanted the chalkboard located. I know, something I should have figured out before I started, but that's the way I work. I also like having the option of moving the chalkboard around without having to repaint everything. Portable=Good. For this project, I purchased the following supplies from Home Depot. 1. 4'x2' Chalkboard MDF (1/4" thick). I didn't even know they had chalkboard MDF so I nearly squealed when I saw it. 2. 4 12"x12" sheets of magnetic galvanized sheet metal. The store I went to didn't carry anything larger so I went with 4 smaller sheets. I gave the galvanized sheet metal a quick sand and sprayed them with two coats of chalkboard spray paint then let them dry overnight. I followed up the next day with another two coats, let dry completely, then cured them by rubbing chalk all over them and erasing. The MDF didn't really need a coat of chalkboard paint, but I did give it one quick coat just to keep the color/texture consistent with the sheet metal. Once everything was dry, I glued the 4 squares of sheet metal to the top portion of the MDF using Liquid Nails. Because I didn't want to damage my walls, I attached the assembled chalkboard to the wall using 3M picture strips. I used 6 of the large size and so far so good. Baby's still hanging! The top half of the chalkboard is magnetic and I can use it to post magazine pictures and notes and the bottom half I can use for my to-do list. I'm really happy with how it came out, but I'm contemplating framing it somehow because I think it looks a little necked. I have a couple of curtain panels coming that will hang on either side of it, so I want to see how that looks first. Love it! Came out great jess! I haven't seen chalkboard MDF either - how fun! This turned out great. Can't wait to see the office reveal. 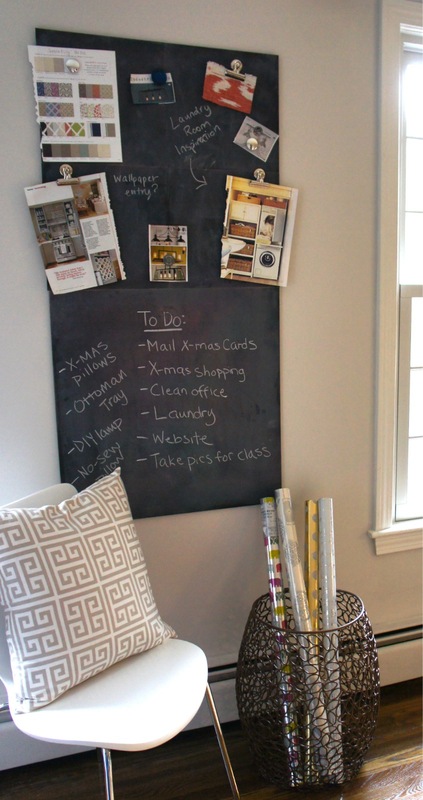 That's a great idea to make it both chalkboard and magnetic. I'd like to do something like this in our kitchen. Thanks for sharing!